Life at 7000 feet: Well hello there! I seem to have forgotten that I have a blog. Actually, my hiatus from blogging wasn't planned but it was nice. Our family of five has been enjoying a lot of family time and it's been wonderful. Because I try to keep a chronological record of things here on my blog, I'm going to fill you in on some of what we've been up to. We enjoyed a visit with John's parents the week before Christmas. One night we opened gifts with them and one afternoon we drove up to Denver to see White Christmas, which by the way, was superb! They also helped us get our Christmas cards and letter stuffed, sealed, and stamped in record time and they kept the kids while we went to a Christmas party. It was a short visit but it was a really nice one. The kids got out of school SO late this year. Their last day was December 21st. Abbey's winter break began a couple of days early because of fever and a stomach bug. Yuck. I felt so sorry for her having to miss her Christmas party at school. She seems to have a knack for missing school parties, but thankfully she didn't share that bug with the rest of us! We got a really big snow last week. I never heard the final snow totals but it was at least a foot (on top of the 3-4 inches that fell earlier in the week). I love snow in December but it definitely gets in the way of my morning walk with friends! We keep plowing through it anyway...and it's always worth it. On Christmas Eve Eve (I love saying that) we drove up to the 16th Street Mall in Denver. We'd hoped to take John's parents when they were here but we ran out of time. We walked around and looked at the lights, shopped a little, and enjoyed a delicious dinner. It was a nice family day! Our Christmas Eve was very low key. The kids played outside in the snow, we cleaned and cooked, watched holiday movies, and stayed in our pjs until church that evening. Abbey kept saying all day that it just didn't feel like Christmas Eve. John and I agreed that it really sort of didn't and we just figured it was because school got out so late this year and no one really had time to relax and let the anticipation build. Abbey leaned over to John in the middle of Christmas Eve worship and said, "Now it feels like Christmas, Dad." I'd be lying if I told you that our eyes stayed dry. Christmas day was perfect! The kids got up SUPER EARLY to open gifts and I must say that Santa was VERY good to all of us this year. We made the choice to stay home this year--and it was the right choice--but it was sad for us not to be with our families. 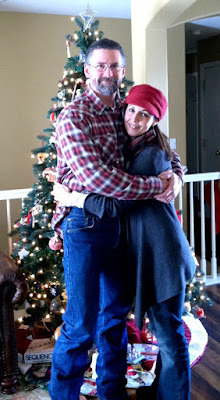 On Christmas afternoon, we played around with a pocket camcorder and made this video for our family in Arkansas. The people who live in my house may disown me for embarrassing them sharing it with you but I'm going to anyway because I think it's fun...and yet slightly embarrassing. If you watch "The Middle" on television then you'll get the ending...if not, then you need to watch that show because it is seriously funny! John has been on vacation this week and we've been out and about almost every day since Christmas doing something fun--the movies, the mall, and a DATE! I'm so thankful that after twenty-one years of marriage, we still love spending time together. The kids and I have another week of him at home with us and we couldn't be happier! School doesn't start back until JANUARY 10. You know I'm loving that, right? I really truly am! John asked each of us at dinner the other night to think of one word that would describe 2011. I've been thinking about my word and I hope to be back to share it with you all soon. He also came up with a fun family slogan for 2012 and I'll probably share that too! Fun times! We stayed home for Christmas this year (first time ever!) and it was wonderful! Christmas Eve service really did finally make it feel like Christmas. Your lovely card is still hanging on our pantry door. it's beautiful! P.s. I got an awesome Razorback t-shirt in my stocking! Now that my sister is in school there I get all kinds of fun things. Need anything? Stressful. That would be my word for 2011. My best-friend-who-is-also-my-hairdresser was doing my hair the other day and asked why I had so much breakage. I told her it wasn't breakage but regrowth from all the hair I lost this year from stress. But just to say stressful wouldn't be the whole truth, because through all the stress I learned to cling to my Savior and Lord a little tighter. Glad you had a good Christmas. I can't wait to see what your family slogan will be for 2012. Merry Christmas (a bit late)! You all have SO much more snow than we do! Jessica commented this year that Christmas comes faster than it used to, and doesn't last as long--I told her she must be growing up. Awwww... I loved watching your video!! It's so fun to hear people's voices! And it looks like everyone had a wonderful Christmas! I like The Middle too. I need to remember to watch it more. I'm jealous of all your pretty snow! I hope we get some this winter. Glad you had a good Christmas Meredith and Happy 2012!!! I'm jealous of your snow! For the first time in a long time we have no snow of any consequence in December. It's very disappointing. We usually have at least one good storm by now. Even my heat loving hubby is wishing for a little snow to play in. Looks like you had so much fun! We had a short Christmas break as well. Our kids got out on the 21st like yours and go back on the 4th. Glad you had a wonderful Christmas, and trying not to be jealous of your snow. Mother Nature seems to have forgotten us here in Ohio this Christmas. Love the video....your family is adorable!! Happy New Year my friend!!! A snow day and a mystery solved!